Inventor Jørgen Aaland was born in Veblungsnes, Norway in 1895. Much of his adult life he lived in the United States, but he returned to Norway and died in Veblungsnes in 1973. Jørgen Aaland was instrumental in the invention of the laminated ski. Early in the 1930s Jørgen lived in Seattle in the United States. He experimented with a number of new products. One of them was special handling bevels under skis. Today, these bevels are called camber. Jørgen believed also that laminated skis would be much better than solid wood skis. The problem was to make a ski of multiple layers. Jørgen had many trials and errors and worked late nights in the workshop. During the winter of 1932 Jørgen knew what he needed to produce a glue-laminated ski, and he saw that the skis had fantastic form, stability and resiliance. One of the first projects that he did in "Aaland Ski Shop" was to make a couple of skis that had resiliance to himself skiing with a backpack. Aalands production methods were similar to the production of fine furniture, and such as were made of "split cane". Jørgen liked the name, and as stated in Norwegian is Splitkein. He compared laminated skis to the good life and fine furniture. Unfortunately, it was no coincidence that fine furniture was both expensive and exclusive. Jørgen knew that he had neither the production equipment, or capital to start mass production of Splitkein ski. He took the idea to the one that had both. Ray Anderson was president of the General Furniture Company, and immediately understood the possibilities in Jørgen's invention. Anderson, who was a known ski instructor enlisted Ben Thompson, to go along with him in the company, Anderson & Thompson Ski Company. Jørgen Aaland, had nothing more than knowledge to contribute, and was employed on the production line. May, 13, 1933, Raymond C. Anderson applied for a U.S. Patent on the ski with three laminations. A week later the Patent Office in the United States received a different application to create a ski identical to Aaland's ski. The application came from a company that called itself "Splitkein of Norway." , which was operated by Bjørn Ullevoldsæter. It was a rare coincidence. The patent office in the United States stated that the parties did not know about each other, and it ended up that both patents were granted. Bjørn Ullevoldsæter later sold his patent to Peter Østby. Østbye did not plan to do his own work, but wanted to sell the patent under license to various manufacturers. Click here to see a copy of the patent. 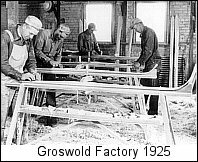 "Licensing rights to produce Splitkein skis in the United States were obtained by Thor Groswold, of Groswold Ski Manufacturers in Denver, Colorado and Northland ski factory in Saint Paul, Minnesota. According to Peter Lunn in the British Ski Year Book—1939, the new laminated skis were far superior to solid hickories because they were lighter and stronger, they would not warp, each ski in a pair was exactly like the other, and they were undeniably faster. The first of these skis were marketed under the Splitkein ("split-cane") label in Norway and as Anderson & Thompson skis in the U.S." Source: International Skiing History Association. "The U.S. market is a very exciting aspect of the business, agreed James Godber, past president of NSIA and one of the men behind Norski Ltd. of Brockville, Ont., Canadian-owned producer of Splitkein and Bonna cross-country skis under licence to A-S Norski of Norway." Soruce: The Globe and Mail (Canada) January 21, 1980 Monday - "Canada's booming ski equipment industry called world's fastest-growing new supplier"